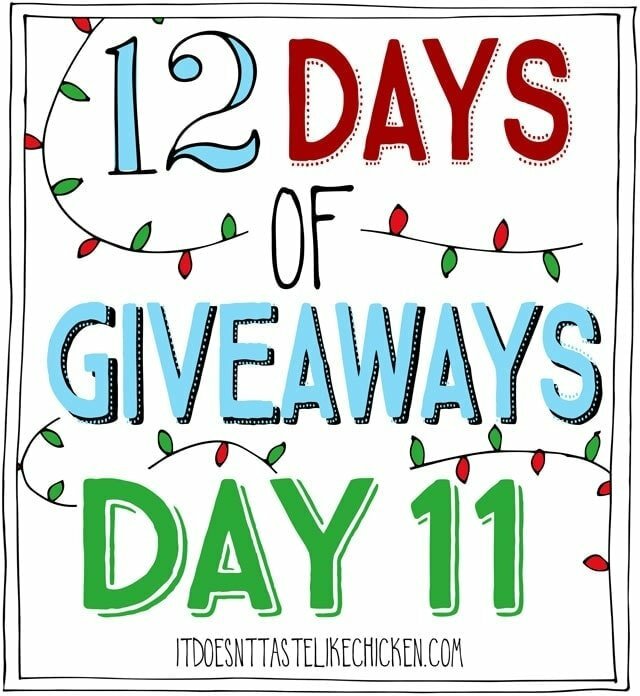 On the 11th day of giveaway my true love (Sam) gave to me, a giant Daiya Vegan Cheese gift box!!!!!! Daiya put together this GIANT gift basket for 4 lucky winners! Each winner will recieve a “find your happy plate” t-shirt and pin, Daiya tote, oven mitt, salad tongs, little wooden spoon, gluten-free pepperoni style pizza, pumpkin spice cheezecake, plain cream cheeze, garden vegetable cream cheeze, jalapeno havarti style farmhouse block, smoked gouda style farmhouse block, the new cutting board mozzarella style shreds and cheddar style shreds. Yeah, I know, that’s a lot of goodies!! 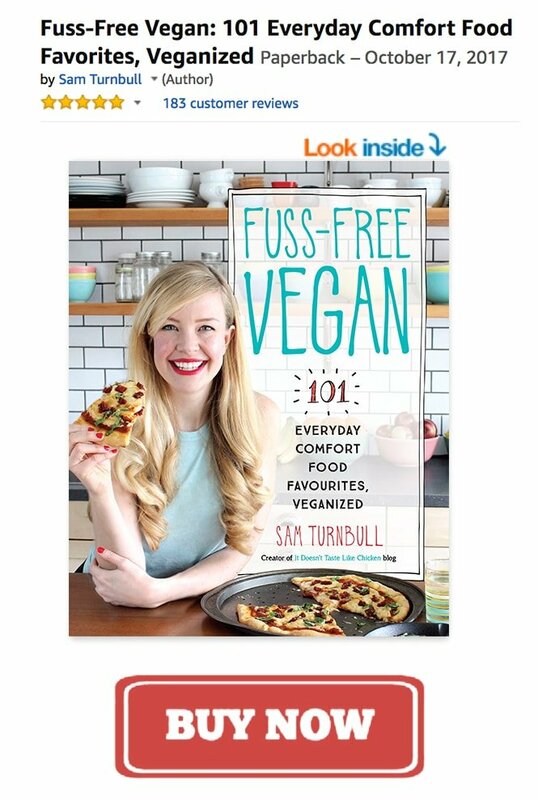 Sounds like a vegan wine and cheese party is in order. 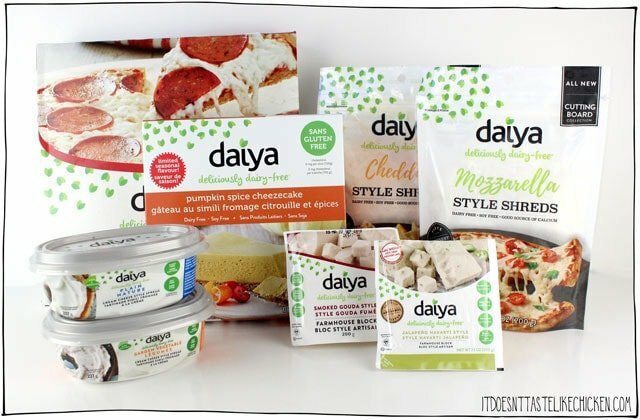 4 lucky winners will each receive a giant box of goodies from Daiya. This contest is open to US and Canadian residents. Previous Post: « Wully Outerwear Vegan Coat Giveaway! I love following your site and also the fact that I can enjoy pizza again thanks to Diaya!! Yay! Bravo to you both. I love Daiya! So excited for this, thank you! Signed up for your email (I’ve made a few of your amazing recipes, so I’m glad to never miss another! ), tweeted about it, and followed you on Instagram! 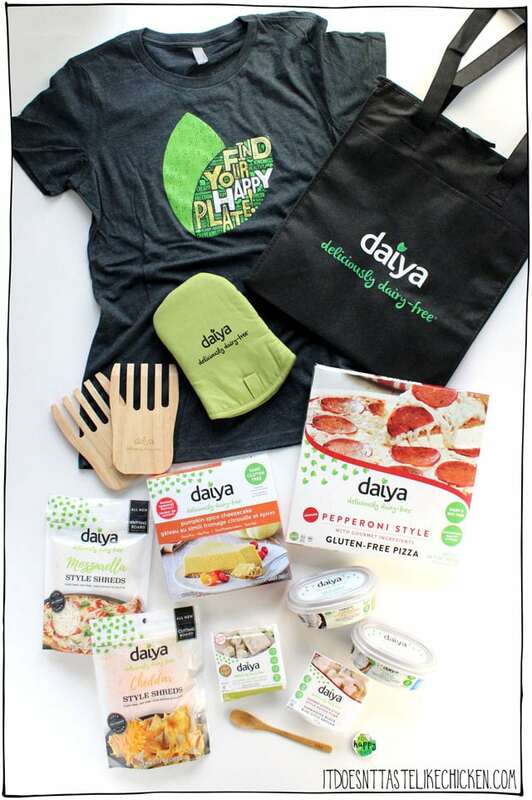 What a fabulous giveaway, Daiya is super yummy! So many awesome giveaways! It also opens up my eyes on vegan products. Thank you.